Peaceful co-existence is the essence of life, says this Rajasthani great-granny from Chennai. Baiji is a darling, her granddaughter says. She is an absolute darling, her grand-daughter-in-law says. She has taken care of me during my sickness even more than my own mother, her daughter-in-law says. These were the instant responses I received from the family of Smt. Anandkawar Chowdhari, an 87-year-old Rajasthani residing in Chennai. Mother of 6, grandmother of 14, and great-grandmother of 17, she is undoubtedly the bridge between members of different generations, and also between her four daughters-in-law. For me, meeting her was a peep into the compromises made by the elders of joint families where harmony and hearts co-exist. As I asked her questions about her life, she replied cheerfully. Her speech is slightly impaired with age, but her family helped eagerly by intervening as well as adding their own responses. Namaste! Can you tell me about your childhood? My maternal family belongs to Kuchera, a village in Rajasthan. But they had moved to Chennai where I was born. My father was a pawnbroker and he allowed me to help him in his work. I still remember how I used to enjoy being around him. During the Indo-Pak war, they returned to Kuchera. At the age of 14, I was married (to Sumatmullji Chowdhari) and moved to Nagaur, which is another village (now a town) near Kuchera. After almost a decade, we shifted to Chennai. I have lived here ever since. This is where my children grew up. Have you always lived in a joint family? Yes, that is the tradition. It continues. But things have changed a lot in recent years, but by God’s grace, the love and affection remains the same. Anita (daughter-in-law): All of us stayed under the same roof until 1999. As our own families grew and given the space constraint, we have now moved into our respective homes with our sons and bahus. Would you define yourself as being the authoritative figure at home? Sushila (daughter-in-law): Not really, she is strict as well as lenient. As bahus, we have always seen her care and concern. Whenever any of us were unwell, and especially during pregnancy, she would take care of us and nurture us back to health. Can you give me some instances? Sushila: Let me tell you about my marriage. Baiji was always particular that she will choose her daughters-in-law. My husband was very particular that his wife should not wear a ghunghat. In fact, it created much curiosity in our locality where I was perhaps the first bahu who did not cover her face with ghunghat in public. However, I don’t know how my mother-in-law managed to convey her own wishes to me without even stating them openly. With her subtle hints, I learnt to wear the ghunghat when relatives came to visit, but to remove it in my husband’s presence. You can call this a double standard, but I think this is tact and diplomacy. Anita: Being the youngest daughter-in-law, more changes took place when I came to this house. I was the first bahu with whom my father-in-law had a conversation because such things were not permitted earlier. Sushila: Once my father-in-law started speaking with Anita, the rest of us also got the permission to do so. Yes, things have changed a lot, gradually at the beginning, but quite drastically in recent years. Shilpa (grand-daughter): If there is one thing that has not changed, it is Baiji’s caring nature. She cares for each and every member of the family. She is the ultimate diplomat. I have seen her managing conflicts easily and playing the role of a mediator. Khushboo (grand-daughter-in-law): She is an epitome of patience and understanding. She does not impose any of her views on us. She strikes a good balance between taking care as well as imparting the right values. Baiji really knows how to make the right adjustments. 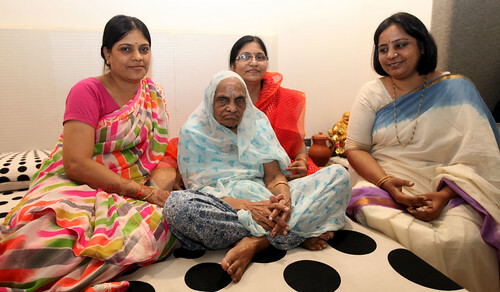 Neha (grand-daughter-in-law): To me, she represents strength since she can handle any kind of situation. I also admire her sharp memory; she remembers the food preferences, likes and dislikes of each and every family member, right from my three-year old daughter to her eldest son. She is not at all orthodox and knows how to adjust with changing times. Baiji, what is needed to ensure peaceful co-existence in a family? Anandkawarji: It is up to us as elders to see that the family members stay in harmony, with each one doing their respective duties. All my bahus are from different backgrounds, hence I think it is my responsibility to keep things smooth between them. I really have nothing to complain. At my age, when I fall sick, the entire family takes care of me. The children as well as the elders shower me with love and respect. What more can I ask for? Anita: The special touch is that each one of us thinks we are her favourite. She manages to care for each one of us in a special way. That is the magic she weaves. What I have really seen today is the need for diplomacy to tackle a joint family structure. Thank you all so much for making this a wonderful interview. First published in July 2014 in Harmony – the Indian magazine for silvers for the column – The Great Granny Diaries. The part-2 of this post is Panchdhari (Halwa) and Besan ki pakodi (Fritters with gram flour) from the kitchen of Anandkawar Chowdhari. She is the 23rd grandmother featured in this column.